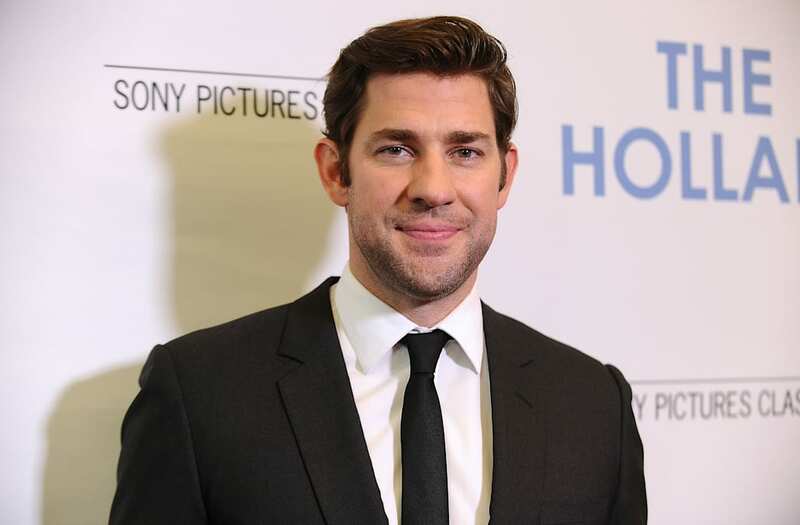 John Krasinski's turn at directing "The Hollars" came about almost by accident. As he recounted to me over the phone this week, he was "openly ugly crying" when he initially read the script over six years ago -- that's how good it was -- but after a series of unsuccessful financing efforts, the film was nearly scrapped for good. That is, until he bought the script and decided to direct it himself. That make-do attitude is what characterized the rest of Krasinski's approach to directing the film, out now on Blu-Ray and digital. Between forgoing a casting director and calling his desired actors like Anna Kendrick, Richard Jenkins and Margo Martindale himself and using his current favorite songs for the film's soundtrack, Krasinski took his role as director incredibly seriously because he "respects [directing] too much" not to. I caught up with John Krasinski this week to talk about his struggle to get "The Hollars" made, flipping through Netflix with his wife, Emily Blunt, and whether or not he wants to keep directing in the future. First of all, I loved this movie -- it's the kind of movie that just doesn't get made enough these days. You took the words right out of my mouth: The reason why I chose to direct ["The Hollars"] is that it was a movie that I think you don't see very often, and I grew up on movies like this. We've all seen a lot of family movies, and this one had a specificity to it and a real heart to it that I hadn't seen in a long, long time -- since movies like "Terms Of Endearment" or something like that. I was so thrilled to do something like this, so I jumped on board. What was it like directing the film while also being in front of the camera? It was weirdly easy, believe it or not! I think it was easier for me to direct the cast, because I got to be in the scenes. What I mean by that is [the cast] was doing such incredible work that I think me yelling "cut!" from behind a monitor and then coming in, giving notes and then going back behind the monitor would've really ruined the vibe. That's exactly how it was for us: We just left the cameras rolling most of the time, and then I would very quietly tell people a couple of ideas and go right back into it. It almost felt as if we were doing a play. Speaking of the cast, it's pretty much second-to-none in this film. Everyone is so good. What was the casting like? Did you have your eye on some of these actors? To be really honest, I had my eye on all of them. We actually didn't have a casting director on this, because I just decided to make direct phone calls to people the way they used to. So, I called everybody directly to tell them the reason why I wanted them to do the movie and explained what the movie was about, which was that I wanted to investigate the powerful idea of a family and show that it's complicated -- and it's not just a crazy family that you go home to around the holidays, it was actually a really real take on it. I was lucky enough for each of them to just say "I'm in!" over the phone, and I think that's the special thing about having this cast: Everyone knew exactly what this movie was. Usually there's a period when you're casting actors where they'll say, "Oh, yeah, I like it, but I just don't like the ending" or "I don't like this one part about my character." For this film, it was clear-cut and people all jumped on at the beginning. When it came to shooting it, I really felt lucky to be front row to watch some of these performances. I think Clint Eastwood has been most recently known for this, which is you just cast the actor for the performance that they're going to give, not for the performances that they've given before. Definitely. Another thing I loved about the film is the major role that music played throughout -- there are a couple of truly great sequences set to very prominent, well-known songs. Was it important for you to make sure that music played a big role here? Yeah, absolutely. To me, I sort of live my through a soundtrack, and I'm constantly listening to music all the time. When I was prepping this movie, I was always listening to these songs, and [the songs in the film] were the songs I was actually listening to. That was really helpful to me, and it felt like those songs really became part of the movie's DNA, because I'd been working on it for so long. Josh Ritter is one of those people who is really as good as it gets. In the way that Bob Dylan was, he's so poetic. I just thought that that was such a great voice for our movie -- if we could get him -- and I told him a bunch of the songs I'd been listening to [to ask if we could use them], and he just said, "Forget it, take any song in my catalogue." I couldn't believe it! Those are the types of confidence boosters that really help you when you're making a movie. Especially a small movie with a low budget, you're so psyched to have people believe in it. How did you come across Jim Strouse's script? Were you on the hunt for something to direct at the time? I was actually sent the script as an actor about six years ago. I was asked to play John Hollar, and I said yes. It was one of the best scripts I had read in a long time. I was openly ugly crying while reading the script, so I thought that if I was openly crying this much while reading the script, the movie would be even more impactful. As it turns out, though, it was really difficult to get it made and get funding for it, so after three years the financier called me and was like, "I can't get this made, would you want to buy it yourself?" And I thought, "Wow, that's a pretty pricey proposition..." But then I bought the script from him outright and got it funded. I felt as if I could get it made and be the catalyst for getting it up the hill. It's one of those things where you're really proud to be able to have the opportunity to have a script like this make it. And after those years of struggling to get the film made, especially after its limited release in theaters, it must feel good to have it finally out on Blu-Ray and digital for home consumption. The truth of the matter is, as far as it coming out on video, I'm one of those people who believes that there is no right or wrong way when it comes to theaters or home entertainment. It's such a subjective experience. To me, there are movies that I will not see any other way but in the theater, and there are other movies that I'm so glad are on video, because I found them at home with my wife just scrolling through iTunes or Netflix or whatever. There's something fantastic about that, too. I don't care how it reaches you, as long as it actually reaches you. We're so thrilled that it's open to everybody now. I will say that there is something about a family movie -- and a movie that is potentially very emotionally impactful -- and watching it with your family. Not to sound hokey, but this is the perfect holiday movie that, when you're at home with your family wondering what to do, this is a pretty good one to watch. It makes you feel things and lucky to be part of a family. My favorite part about this movie is, whether you get along with your family or not, it's still where you're from. They're the people who know you best, and they're in your DNA. They know you better than anyone in your entire life is going to know you, and sometimes there are people who are disconnected from their family, but this movie is about people who are giving it another chance. Before directing "The Hollars," you hadn't done too much directing. Is this something you want to do more of in the future? Directing is something that I love very much, and it's been really fun. Like you said, I haven't done it much, but I've slowly been learning. I'm still learning about it, and I'm sure that by the time it's all over I'll still be in the process of learning. What's really fun about it is that you do get to grow and change. I think there's something to be said about directing, because you're putting your stamp on something even more than you would've with an acting performance, because it's such an all-encompassing, creative experience.